As a lifelong Colts fan, this NFL season was shaping up to be an utter wasteland ( Colts are 0-12), then along came Tim Tebow. Tebow won two national championships and a Heisman trophy in college, but has been routinely panned as not having the skills needed to be a pro quarterback. After going 1-4 at the beginning of this season, the Denver Broncos switched to Tebow and have won 6-of-7 and lead their division. (OK, they have away games at the Bears and Patriots coming up, so the bubble might burst). But I am pulling for Tebow and the Broncos like I have for no other team since Johnny U. hung us his high tops. Why? Tebow is a committed Christian who has taken a lot of criticism because of his faith. He kneels during games (panned as “Tebowing”) and thanks Jesus for his success. When asked about his latest comeback win against the Vikings, he told Peter King that he was most proud of the fact he was able to say “hello” in the interview to Blake Appleton, a young fan who is suffering with cancer. He then ended the interview with “Have a good day, Mr. King. 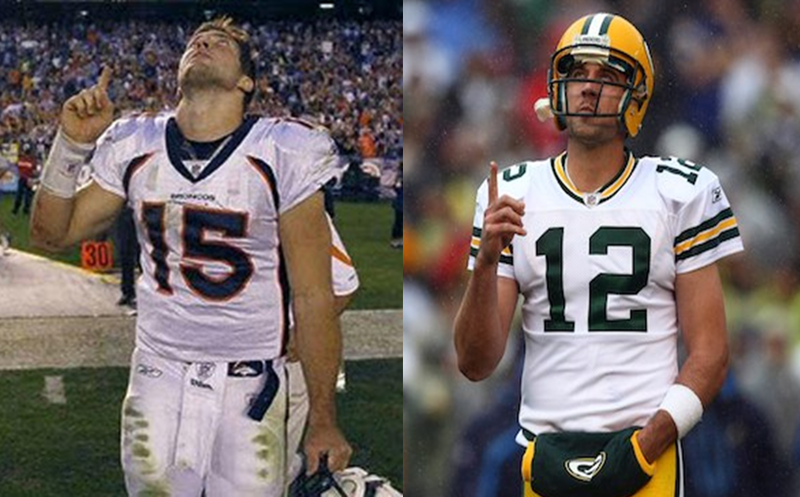 And God bless you.” Tebow isn’t the first NFL player to pray or thank God (Kurt Warner, Troy Polamalu, etc. ), but Tebow has been mercilessly criticized for his faith. One player taunted him after a sack by striking a prayer pose. The kid is a tremendous character kid; If he said he wanted to marry my daughter, I'd be happy… But I wouldn't want him to be my first-round draft choice starting quarterback, which he's not capable of being right now. (Tim, I have two daughters... I'm just saying). But the Broncos keep on winning, and Tebow keeps on pointing to Jesus. But I just have to think that the criticism he has received has nothing to do with football skills (or lack thereof) and more to do with the audacity of being public (and genuine) about his faith. I feel like my stance and my desire has always been to follow a quote from St. Francis of Assisi, who said, 'Preach the gospel at all times. If necessary, use words.' So basically, I’m not an over-the-top, or an in-your-face kind of guy with my faith. I would rather people have questions about why I act the way I act, whether they view it as positive or not, and ask questions, and then given an opportunity at some point, then you can talk about your faith a little bit. OK, so now I’m also an Aaron Rodgers fan— maybe the Packers can play the Broncos in the Super Bowl. These are two very different approaches to bringing one’s faith into a high profile job. Which approach is the best? God definitely wants us to bring faith to our jobs (see Eph 6:5-7, Col 3:23). That faith must shape and mold us at work just as it does in every other aspect of our lives. And the faith that shows up at work just might influence people around us in more ways than we realize.